My favorite fish CUT OPEN by plant roots! 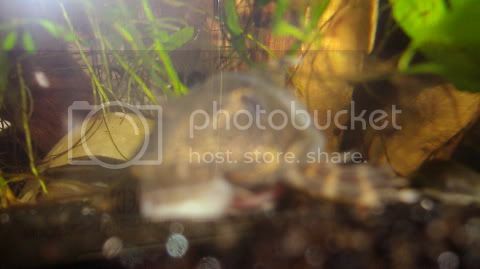 Posted: 2006.08.15(Tue)23:58 Post subject: My favorite fish CUT OPEN by plant roots! On top of a number of other things that have been happening lately, a terrible thing has happened to my favorite fish. This story is hard to tell, and has taken a long time to write, it's so upsetting. About three weeks ago, a firm came in to do some work in the house, and some of the work that was done involved hammering and banging, even though I was told it would not. I tried to protect the fish tanks, by holding them to stop the vibrations, but I think I failed. 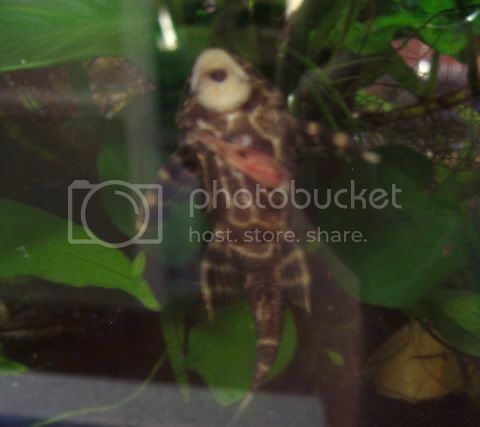 My Panaque maccus, or clown pleco, my favorite fish, disappeared, and went into hiding. Convinced it was shock from the vibrations from all that rhythmic hammering and deafening banging, I left him in peace to recover. 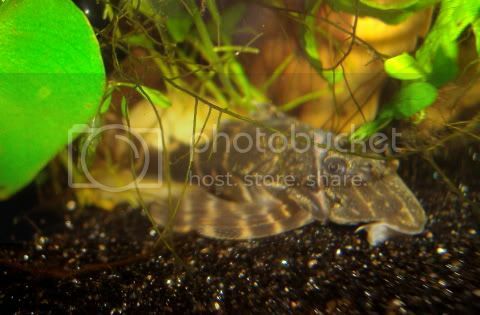 The tank is very heavily planted, and if a fish wants to hide, he can. I didn't see "Mac" again until a few days ago, when I discovered him upside down in distress on the rhizome of the java fern. He was gasping, and his orange stripes were almost white. After a while I thought he would feel better if he could be upright again, so I tried to nudge him gently off the rhizome cradle. When I couldn't budge him, a closer look revealed that he had somehow gotten entangled in the long, adventitious roots and was literally tied to the rhizome - trapped. This was indeed a freak accident brought about by panic over the sound wave shock. The only way to free him was to cut him loose, and to do that I had to remove the section of the plant that he was attached to, and "operate" out of the aquarium. I did so, cutting out the section of rhizome with Mac still attached firmly. So tightly enwrapped was he, that even using Swiss precision nail scissors, I had trouble getting between the roots and the fish. It was a difficult and stressful operation. and that a large area of muscle and tissue was exposed. This is Mac right after being freed. The photo is poor, but the bulging red area on his underside is obvious. When I saw him close up, it seemed to be a large section of muscle, only. To my untrained eye, it seemed as if the vital organs were still inside. I have just, in the last 15 minutes, found my first fish, Sammy the female bristlenose floating and she had been attacked by the other fish (after dying). I had to get my husband to get her out, it was awful. I really hope Mac pulls through, you did a great job - your best, and that's all you can do. I am sorry to hear about your favourite fish being sick and I do hope your catfish recovers. All the best.. This is horrible!!! I hope he'll be okay. Please keep us updated.
! I'm so very sorry. I hope that he can recover from such a horrible accident. Posted: 2006.08.16(Wed)7:32 Post subject: The "operation"
You guys are the best! Thanks for supporting me. I know there's nothing you can do, even advice is hard to give in this case, but I'm grateful for your concern. Anna, I saw the post about your bristlenose. How sad! Please supply the details requested, because I might know someone who can answer your question. Back to Mac ... well, I have been devoting myself to keeping things comfortable for this fish until I can understand the extent of his injuries, and what would be best for him. It was a problem just figuring out how to start. I told you how I had to cut him loose, and to do it I had to remove him and the section of the plant out of the aquarium, and into a small, shallow tub filled with aquarium water, because the job needed to be done underwater. He struggled and thrashed a lot at first, which is understandable, but made it quite difficult to see where to start cutting with the scissors! I trimmed him free strand by strand, pausing between each cut to inspect him. The process took some time, as I had to be very careful not to stab him with the scissors. The whole time he seemed pretty lively and energetic. He tried to get away from me at first, but then after a while, he calmed down, and I was able to see my way clear to cutting his bonds. Don't ask me how I know, but I'm sure he realized he was better off staying still, because when he did he became less entangled. Fish are not dumb. He knew he was being freed, little by little, and that I was helping him, not hurting him. Anyway, when he was completely free of these bonds, I released him back into the aquarium where he swam off, acting normally. I was able to get a couple of photos - something that was so difficult to do when he was whole and intact! Here he is giving me a reproachful glance, and I don't blame him. but part of a more gruesome wound that continues across the chest. You would not believe how tightly wrapped he was. No wonder he was cut so badly! I released him back into the aquarium, because it seemed the best thing to do. He was not dead or even half-dead, but very lively, despite everything that had happened. He had shown he still had plenty of life in him, and I thought, I hope he lives, but if he's going to die at least he'll be in familiar surroundings with his usual tankmates. Geesh, how awful and what a fluke thing to happen?! Keep us posted on his progress! P.S. If he is eating, perhaps there is an antibiotic you could add to his food? What an absolutely bizarre accident! I really hope he pulls through. Posted: 2006.08.16(Wed)14:11 Post subject: Photo of chest wound. Ryan, Cathy, good to hear from you and thanks for the advice. Mac was twisting and struggling in the roots for who knows how many days undetected, and he has sustained several serious injuries, which I can now see clearly. His beautiful, sail-like dorsal fin is gone, churned away down to his back. Just a few shreds remain. The tail fin and the fins on the left side are shredded. The other side doesn't look bad. His left side has some kind of whitish patch, and this is what I'm most concerned about. It looks like some of the scutes are missing or rubbed off, and I fear some kind of rot (fungus or bacteria) will set in. A complete, diagonal chest slash, cut through to his insides by the garotting nature of all those tightly wrapped java fern roots entwined around him. How he managed to get so entangled I'll never know. It is a one in a million disaster that no one would anticipate. He's laid open like Alexander the Great. Anyway, despite this grisly wound he seems to be functioning. He is eating his peas and his veggie flakes - I'm trying to keep him on a high fiber diet - and he is always on his piece of maple wood, so I assume he is eating that as usual. I do not know how he is excreting. It may be normally, or not. I can't tell. He seems to be satisfied, and is not gasping for air, or flopping over, or acting sick. One thing he is doing differently is that he is spending more time on the glass. I suspect this is because it is cool and smooth and feels good. I've decided to use Melafix, and not antibiotics at this time. I do have some erythromycin on hand as Myacin, and this is a good product which I'll use if it comes to it. I'm encouraged by his behavior. Wow, this is an incredible story. The slash wound looks clean, with no evidence of infection as far as I can tell from the pictures -- no redness or swelling, no exudate. Can you get a picture of that whitish patch? I've read some amazing recovery stories about injured fish. Keep us posted, we're all hoping for the best with you.